The Fire Safety Order 2005 replaces previous fire safety legislation and requires all businesses to conduct a fire risk assessment and to put into place adequate fire prevention and evacuation procedures. Any fire certificate issued under the Fire Precautions Act 1971 ceased to have any effect. Now, everyone must carry out a fire risk assessment and keep it up to date to ensure that all the fire precautions in your premises remain current and adequate. We would be happy to provide a free quote for all your fire risk assessment needs or for fire awareness training for your employees. We do not ourselves provide fire fighting equipment or supplies. We will assess your needs for equipment, servicing and training as part of our fire risk assessment and because we have no conflict of interest we will provide you with the most cost effective solutions to these issues. You must provide a work environment that is safe and emergency evacuation procedures that will enable your employees and visitors to escape the premises in the event of fire. 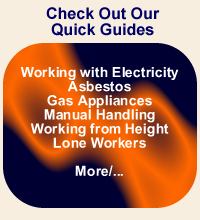 Take at look at our Fire Safety Quick Guide for an overview of your obligations and then contact us or call us now on (01452) 864213 for a free quote. We are rarely beaten on price or professionalism. are properly managed and controlled.